The first picture on this page (below left) is from 1991. I was one (far right in the photo) of several volunteers helping the staff start construction of the gazebo by digging the holes for the support posts. 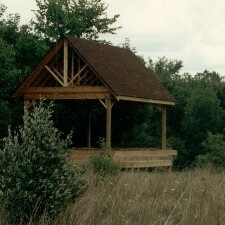 In 1991 this structure seemed to be way out in a field, meant to be used as a remote teaching station away from the other buildings. Over the years, brush has been removed and the field mowed bringing it seemingly closer to become part of the main campus for events and programs. Over the years I have not had a significant amount of time to volunteer. However, I have cut and split logs, spread wood chips on the trails, helped several times with festivals, and had a brief stint on the board of directors. My relationship with Woldumar actually began in a volunteer capacity, but it was as a parent chaperone when my kids' classes came here to visit, and, of course, I have offered the free use of my photography over the years. Other than being a member and visitor, my photography remains my extra involvement here today. Full size originals of the images you see in these pages, along with almost every other picture I have ever taken on the grounds, are duplicated in a computer I keep in the gift shop. The photos are available both for the organization's use and for purchase by the general public** (see details at bottom of page). The gift shop is located in what I refer to in my files as the Interpretive Center. It is the first building you typically see upon entering the parking area. In addition to the gift shop, it has many displays, a bird viewing window, some critters in aquariums or cages in the lower level, bathrooms, and in the past it was the spot where the great pancake breakfasts took place. Starting this page it occurred to me that I had never taken a picture of anything on the main floor of this building. Since the 2009 American Heritage Festival was taking place this past weekend, I have now remedied that. Downstairs, I had already taken a few pictures of the critters who dwell there. However, the light is low, and I prefer avoiding the use of a flash if I can. Fish, snakes, and even turtles move just enough at really slow shutter speeds to make an in focus picture difficult to take. Below are a few of the better shots to have turned out acceptable enough for me to keep, plus the 2009 shots. Some of the animals are here because of injuries. And sometimes they are sleeping, which tends to limit the picture possibilities. The above photos from downstairs show a number of live animals. As we move upstairs (now that I actually have some photos of the upstairs) the animals are stuffed displays. Many have been donated after being hit and killed along our roads. I mentioned there was a bird viewing window in this building. It is located just to the right of the gift shop (second row above). Some feeders attract the birds to this area. The picture at left was taken through that window. I also said there are restrooms located in this building. A little farther to the right of the bird viewing window are the stairs leading to the lower level and outside. The restrooms are at the bottom of that short stairway. At the restroom level you go to the right to get to the exit, or go to the left for another short staircase (in what would be called a switchback on a road) to get to the area with the aquariums already shown. I went to all this explanation because of the above right photo which I took (2009 AHF). The drinking fountain is between the men's and women's bathrooms. I am standing at the bottom of the first short stairway. Is it just me, or does it look to you like the sign is pointing to the women's bathroom? It is the logical place for the sign, since few would likely see it on the side wall actually pointing at the other stairs, but some things just strike you as funny in the moment. 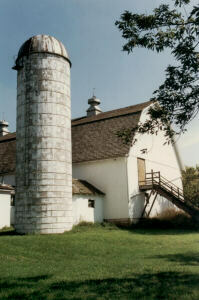 As you exit the Interpretive Center through the side door (by the restrooms), the first thing you are likely to see is the R E Olds Anderson Rotary Barn pictured above in 2008. 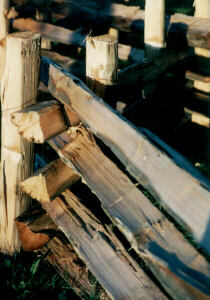 It has seen some significant renovations over the years. The photo below left was taken in 1990, while the one below right shows a different roof by 2005 when it was shot. In the second row below you see the transformation of the outside staircase from on the left in 1989, being moved to the right in 2003, and its present look already completed by 2005. All of this was taking place for a conversion from storage to classroom, meeting room, and currently even theater group spaces. As we walk inside, we enter a large open area which can be used for a variety of purposes. The two pictures below from the American Heritage Festival give an example. Smaller meeting or classrooms are to the right on this level. The upstairs is pretty much totally open except for the stairwell at one end and a wall creating a backstage area at the other end for events, theater, and additional presentations. I did not notice if they were still there, but in the past, the walls were lined with various farming, logging, and carpentry tools from over the years. The second row below is from 2004, 2008, and 2009 (left to right). Along the walls in the stairway you can see some historical photos and other memorabilia. The last row (third below) of photos of the barn are simply pictures which I like, including one in the winter, since I have relatively few winter shots overall. 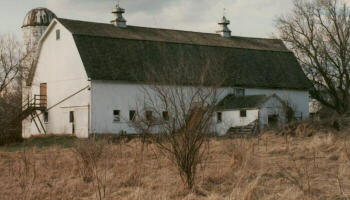 Except for the log cabin (which has its own page), the IC and the barn are the main public buildings. Rounding out the primary structures is the Administrative Offices Building. However, structures include more than buildings. There are corn cribs, corrals, split rail fences, bridges, benches and more, which help to enhance the Woldumar experience. Most often, it is volunteers creating these amenities and aesthetically pleasing extras, including the wide array of flowers and other plants you will find around many of the buildings and structures. A mix of such pictures follows this text. Plus, the last eight rows show you some photos from the Wildflower Weekend, a relatively new annual event taking place in the springtime. ** There are a few actual prints of mine (a touch of william) for sale in the gift shop, but primarily my photography is available for purchase as digital files from the computer I maintain there. All 35mm and digital photos appearing in these pages can be found by noting the photo numbers (right click properties) from this site. As long as they are for personal use (not for resale or product development) the cost is $1 per image. You will need to bring in a portable USB drive to transfer the pictures onto. Any purchase of 25 photos gets you an additional 25 free (cutting your cost in half to 50 cents each). Plus, here is a bonus I just now decided to offer. Since you have explored these pages to this point, at right is a special coupon giving you another 25% off. That could get your cost down to less than 38 cents per picture, depending on how many you purchase. Simply print the bottom of this page and take the coupon with you to Woldumar. A permission provided with your purchase allows you to print the images, duplicate them on your computer, your website, Facebook, or pretty much any other non-commercial personal use. any "a touch of william"